Bird of Paradise Flower, a stunning colorful tall tropical flowers. Give your wedding or special occasion that rain forest feel. Also known as the Crane Flower due to the bloom resembling a bird. Colorful shade of orange and blue gives this flower its appearance of an exotic bird in flight. Bird of paradise flowers represents faithfulness, love, and thoughtfulness, making it a symbolic flower for wedding or other romantic occasion. Due to the tall nature of these flowers, the Bird of Paradise if perfect when making tall tropical flower arrangements. They are a great way to add color and joy to any bouquet or centerpiece and are popular for weddings or corporate events. 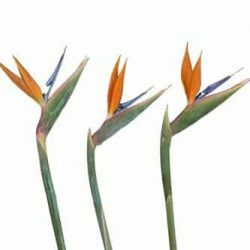 Buy Bird of Paradise in bulk flowers online for weddings and special occasions.